DISCOUNTED BAGS! We have variety of bags for everyone, like leopard bags, hobo bags, shopping bags, shoulder bags, laptop bags, groceries bags and more! 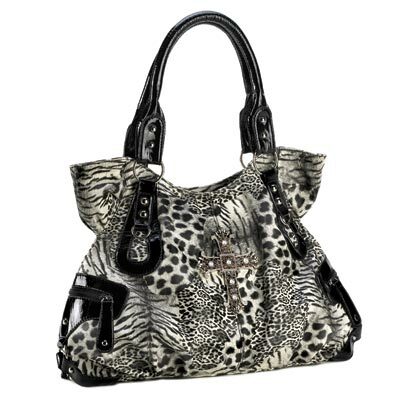 Sophisticated style with just a hint of wild side, this gorgeous tote bag will elevate the style of any outfit. The neutral-tone leopard pattern get a fantastic textured finish, black handles, and golden hardware. Body: 15 1/2" x 5 1/4" x 12 1/4" high; 16 1/2" high with handles; adjustable strap is 32 1/2" long. 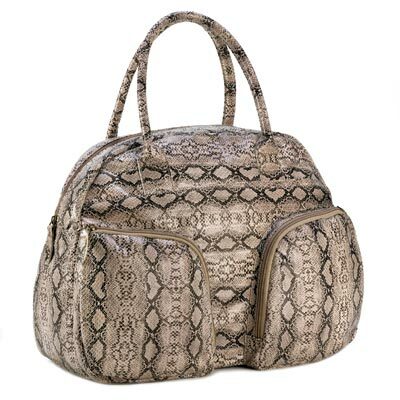 Dimensions 15.5" x 5.25" x 12.2"
This fashionable bags woven texture stands out in the most stylish way. The bag features a removable shoulder strap, two gold-tipped handles, and golden details that make this purse look like a designer tote. Inner pockets with zipper closure and inner bag compartments. Zipper closure. Body: 17" x 6 1/4" x 12" high; 20" high with handle; adjustable shoulder strap is 26" long. Black and white checks are timelessly chic and always fashion forward! This gorgeous crystal wallet features large faceted black and clear gems framed by rows of glittering stones. It will easily hold your cards and cash, and even comes with a wrist strap so you can carry it in style. Zip around style, 10 card slots, 3 compartments, and 1 pocket with zipper closure. 6 1/4" strap. Dazzle and shine all the time with this luxury wallet! The front face features rows of large faceted clear gems that are surrounded by small glittering stones, and all you have to do is simply unzip it to stash all your cash and cards. This wallet is so fashionable that it comes with a wrist strap so you dont have to hide it in a purse. Zip around style, 10 card slots, 3 compartments, and 1 pocket with zipper closure. 6 1/4" strap. 10016126 - HOLLYWOOD GOLDEN TOTE BAG. The sun-kissed metallic shine of this bag will make all your stylish dreams come true! You can fit all your essentials in this oversize tote, and with its studded design and shimmering leatherette construction, you'll look like a superstar with this on your shoulder. 20" x 7 1/2" x 20" high; 23" high with handles. This edgy clutch purse will add a little wild style, day or night! The black-on-black skull pattern purse features stud and sparkle details punctuated by a silver skull and detachable chain strap. 2 seperate compartments with zipper closure, 2 pocket compartments, 1 pocket with zipper closure. Flap features a magnetic closure. 13 1/2" x 2 1/2" x 8 1/2" high; strap is 41" long straight. Carrying this cool black tote will add some rock-n-roll attitude to your outfit. The bag features a crystalline skull and cross bones on top of the black-on-black skull pattern, edged with stud detailing. 2 pocket compartment, 1 compartment with zipper closure. Magnetic and zippered closure. 12" x 9" x 13" high; 20 1/2" high with handles. 10015990 - This fantastic tote bag is one hot accessory! Equally chic, classic, and contemporary, its black and white checkered pattern is framed by black leatherette handles and an adjustable shoulder strap with golden accents. Inner pocket with zipper closure. Zipper closure. 10015989 - Take your style to a new level with this rich tote bag. The oversize design is highlighted by the geometric gold stud detail running down the front of the bag. The alluring merlot hue makes it a great accent to any outfit. The alluring merlot hue makes it a great accent to any outfit. Outer pocket. Magnetic closure. 10015987 - RADIANT ORCHID MIX PRINTED CLUTCH. The colorful embroidery on this asymmetrical clutch and shimmering detachable gold chain make it perfect for daytime use and those special evening occasions. Fabric pattern on actual product may vary. A gorgeous finishing touch for your prettiest outfit! 1 inner pocket with zipper closure. Flap features a magnetic closure. 10015986 - A timeless wallet that will always be in style, this attractive houndstooth wallet features a golden zipper to keep all your cards and cash secure. The black and white pattern will match just about any purse, and looks great when you carry it on its own! 14800 CLASSIC LAPTOP SHOULDER CASE! 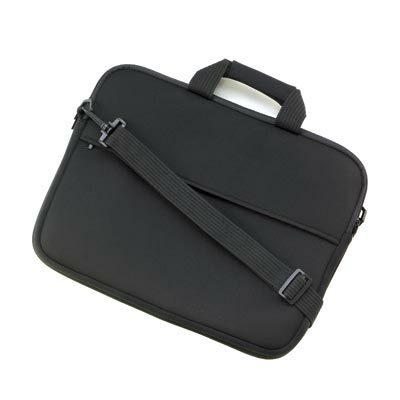 Take your laptop along for school, work, or just plain fun— but keep it safe in this sleek case! Cushioned exterior guards against jolts and scratches, handy shoulder strap adds grab-and-go convenience.